The Australia fullback will remain with the Waratahs until 2022 after penning a new long-term deal. 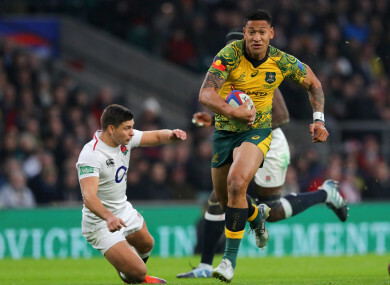 Folau in action against England back in November. The Wallabies fullback had been linked with a return to rugby league, while the Reds and Sale Sharks are among the clubs who were reported to be interested in the prolific 29-year-old. “I’m really grateful to Rugby Australia and the Waratahs for all they have done for me. When I made the switch to rugby five years ago, I could never have dreamed that it would have gone this well.” said Folau, who sits fourth on the all-time list of leading try-scorers for the Wallabies. “I’m looking forward to working hard and doing whatever I can to help the team achieve what we want to achieve both this year and into the future. Australia head coach Michael Cheika said: “Israel’s contribution the Wallabies since making the switch shows why he’s one of the best players in the world. Email “Folau ends speculation over future by signing new Wallabies deal ”. Feedback on “Folau ends speculation over future by signing new Wallabies deal ”.